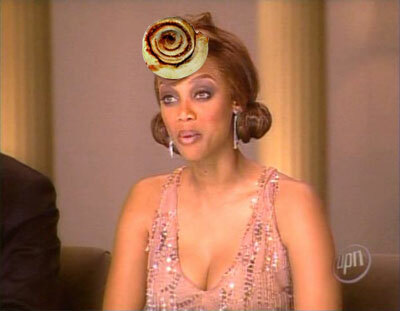 These Norwegian cinnamon buns went straight to my head. Not like I wore one of them as a dapper, yeasted fascinator. I mean that for a short time I got really up myself, alarmingly egotistical from my own excellence at having brought something of this level of deliciousness into the world. However, I have to acknowledge that in fact I was just conduit, a mere flume for someone else’s excellence. It was Nigella Lawson who actually provided me with this recipe (via her book How To Be A Domestic Goddess, not via her own velveteen voice during a cheery, injokes-aplenty tea drinking date, alas). Should probably also acknowledge Tim for not sneering when I’d say things like “I can’t believe how delicious these are. Why aren’t you showing more outward amazement? Do you feel about me like I feel about myself right now?” If you think you can handle this potential vaingloriousness, plus a little light kneading and rolling, then please feel free to give them a go yourself, too. It’s just that the smell of them baking was so intoxicating, and then on top of that they absolutely delivered on flavour, providing a heady one-two punch of buttery crumb and sweet, spiced centre which left me almost woozy with happiness after eating one, still warm from the oven. Hence the spiralling vanity to match the spiralling dough. I really love making bread and have worked my way through most of Nigella’s yeast-related recipes, but this one was new to me. Something about creating cinnamon buns en masse like this pleases me and despite having a few steps, the recipe itself is actually surprisingly straightforward – there’s no long rising time, the dough comes together quickly and all the yeast makes it stretchy and pliable – and the rolling and cutting can’t be that difficult otherwise I would’ve mucked it up somehow. Important to note is that you’ll probably need more than 600g flour, and also that I’ve lowered the baking heat a little and cooked them for slightly longer instead. 1 roasting tin approx 33cm x 24cm, lined with a big piece of baking paper that extends over both ends of the tin. Place your flour, salt, sugar and yeast in a large bowl. Melt the butter and whisk into it the milk and eggs, and then stir this into the flour. However, you can save on dishes by melting the butter in one large bowl (either in the microwave or set over a small pan of simmering water), stirring in the eggs and milk, and then measuring in the flour-etc ingredients. Mix to combine, and then knead until smooth. I found that I needed to add quite a bit more flour at this point – the dough was just far too soft to knead successfully otherwise. Just sprinkle and push as you go till the dough feels springy and soft, but with solidness to it. Cover with clingfilm and leave to rise for 25 minutes. Which it will do with gusto, having so much yeast within it. Then: take 1/3 of the dough and stretch/roll it to fit the base of your tin, which will in turn become the base of each bun. It will fit, but if you’re having trouble, let it rest for a bit before continuing to stretch it. 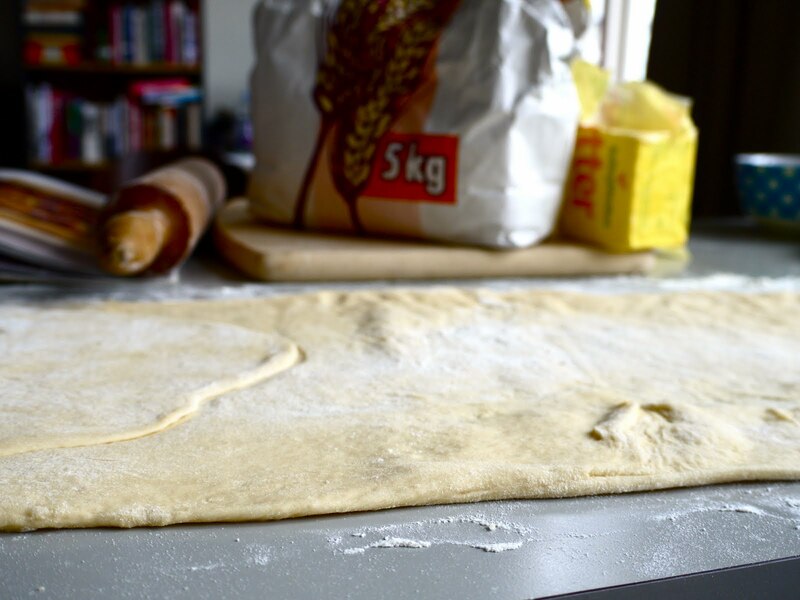 Roll the rest of the dough across your bench till it’s roughly 50cm x 25cm. 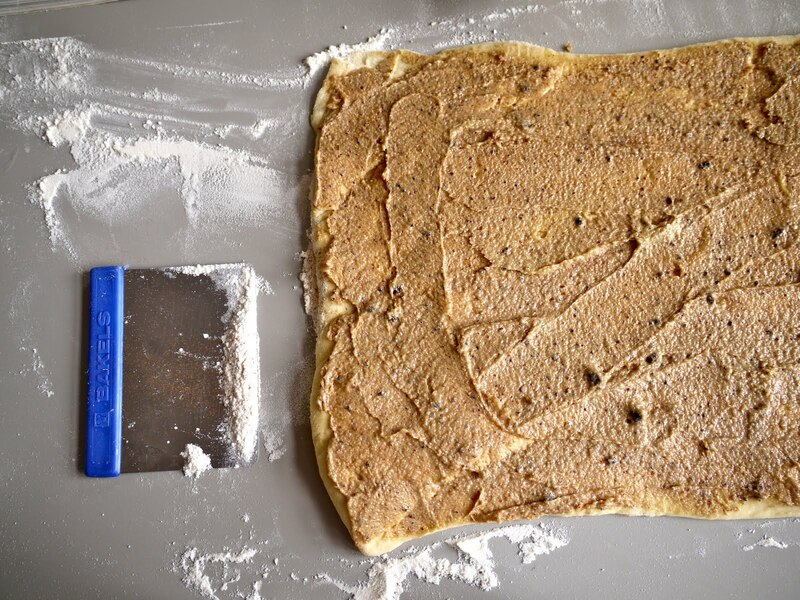 Beat together the filling ingredients – oh deliciousness – and then paint this across the top of this dough, trying to get it even and right to the edges. I used a spatula, it was great fun. 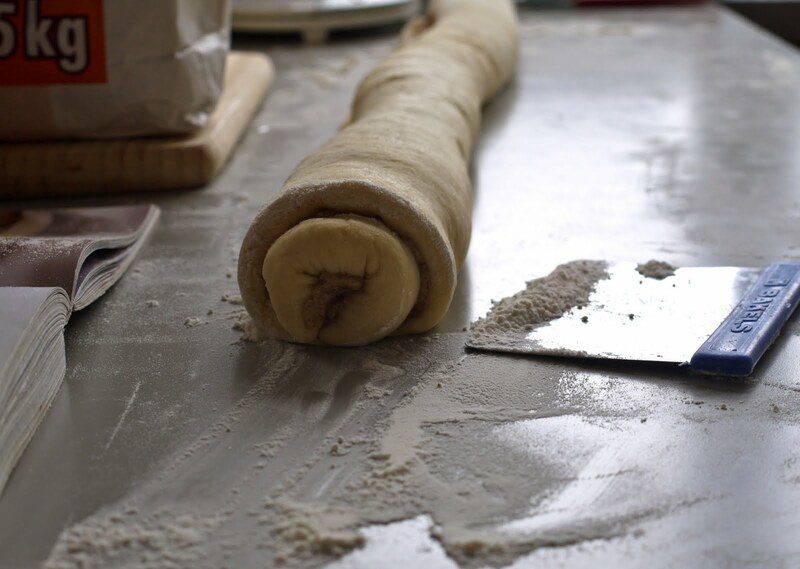 Roll this up carefully from the longest end, so you get a very long, thinnish coiled of dough. 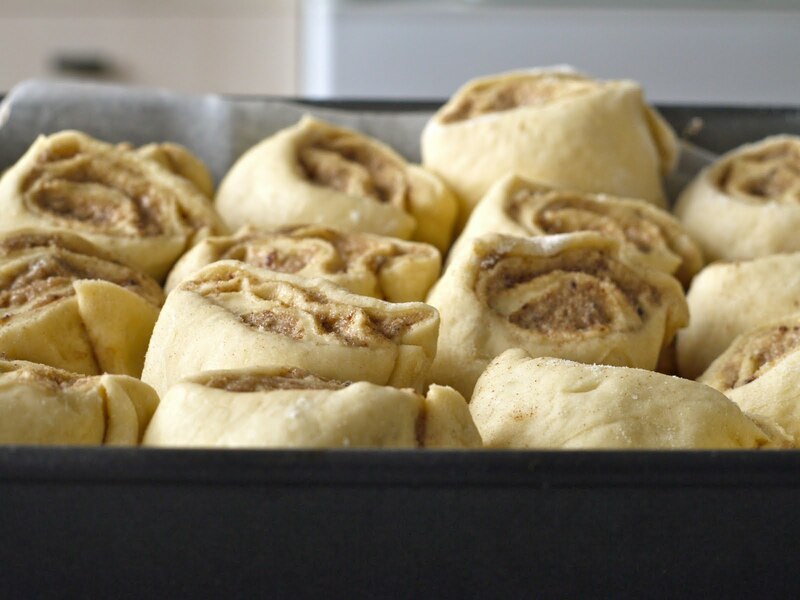 Carefully slice this roll into 2cm slices, and sit them on top of the dough in the tin. They will rise, so don’t worry if it’s not quite full. 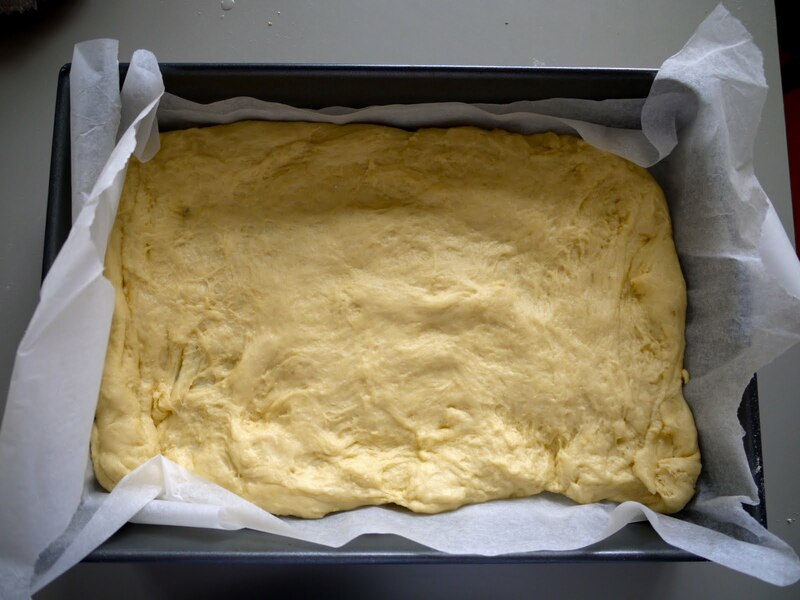 Above: I considerably overestimated what 50cm was, hence the fold in the dough above. A measuring tape is pretty handy here. Above: rolled up, ready for slicing. Nigella uses egg but I just brushed them with a little milk, and then while your oven heats to 220 C/430 F, allow the buns to sit there and prove for 15 minutes. Pop them in the oven for 25-30 minutes, keeping an eye on them as they can burn easily with all that sugar. Cover loosely with tinfoil if necessary. Allow to cool slightly before eating by tearing off each bun as you need it. They are seriously, so extremely good. The dough is buttery with a soft, flaky crust and smells like croissants. Its filling retains a little pleasing sugar-grit, without being tooth-dissolvingly sweet. They remain tenderly delicious days later, and as I said, smell absolutely incredible. When I was a kid one of my favourite meals was buttered toast with cinnamon and sugar sprinkled on it, and this is, in a way, like a much fancier version of that, the comforting heat of the cinnamon dispersed through every bun. Seriously. Smug-ity justified. In my mind at least. If you’re in Wellington this week, on Thursday and Saturday Tim’s going to be in this opera called Mozart’s School For Lovers at Mighty Mighty, it’s like a cool, funky reworking of Cosi Fan Tutte (just click the link, I always make it sound awful when I try and explain it) and it’s only $5 a ticket, yay! Opera for all! Title via: inspiring brilliance-generator Missy Elliot and her 2002 song Work It from Under Construction. Mayer Hawthorne, Just Ain’t Gonna Work Out, as well as being a modern soul man with a gorgeous voice (whose Wellington show we’re unfortunately missing because we’re saving for our trip, but still: bigger picture) he is also apparently also something of a food blogger, logging videos of his adventures with/during food – swoon. Tony Award winner Alice Ripley’s song of praise to mysterious Suburbia from her album Everything’s Fine. This woman is amazing. Next time: the ginger cut-out cookies get their day in the sun. I was already caught from the sneak peek you shared on Twitter. They look so fluffy ! Oh Laura, you're so funny. These buns look absolutely fantastic, and I can totally relate to the way you are feeling – I am feeling like that about my bacon which is curing at the moment. Absolutely loving myself sick, and it's not even ready yet!! Nope, Laura, sorry, I only eat Icelandic Cinnamon Buns. Haha, I too get annoyed when Eric doesn't get as outwardly excited as I am when I make something delicious. But it's ok, you're allowed a bit of smugness when you make something that looks this amazing. I can almost smell it from here!! Oh I love these. I love that book! 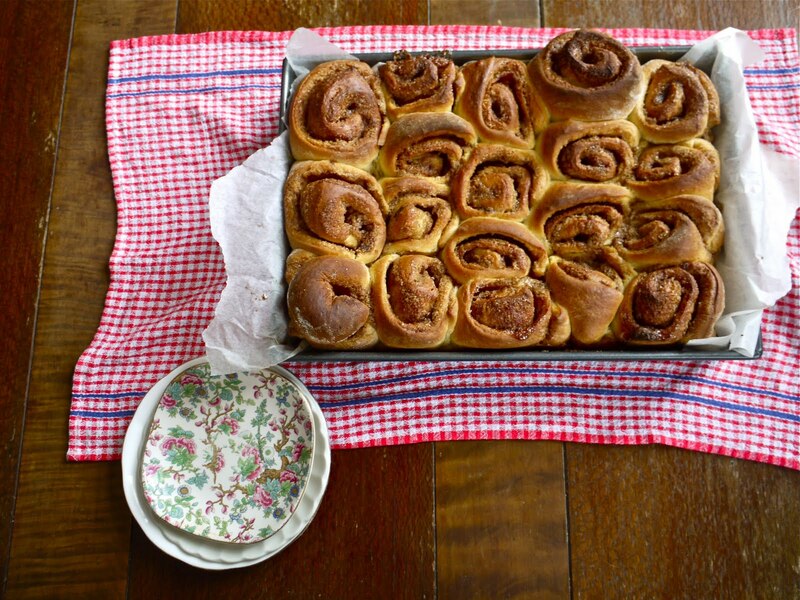 I must admit last time I made cinnamon buns I cheated (using a breadmaker for the dough) but these are a winner. 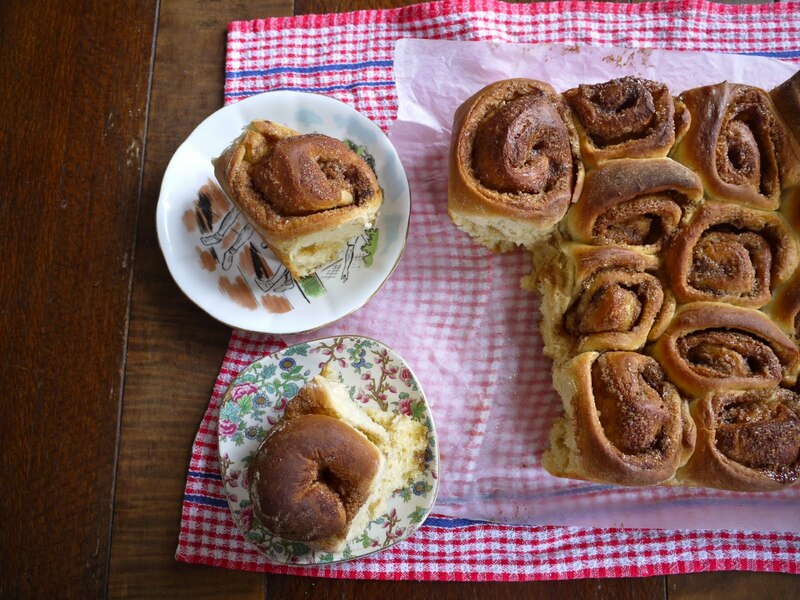 I'm pretty sure the way to anyone's heart is with cinnamon buns, awesome! Something very nostalgic about the smell of cinnamon! One of the first things we learned to make in primary school cooking classes was pinwheel scones using a good amount of cinnamon. The same principle without yeast. Probably not as nice tasting, though. ummm, who needs a hood bakery when you do baking like this!! Delicious. Ok so now I have to make these and look at purchasing a copy of Nigella's Domestic Goddess (Goodness!??) book. 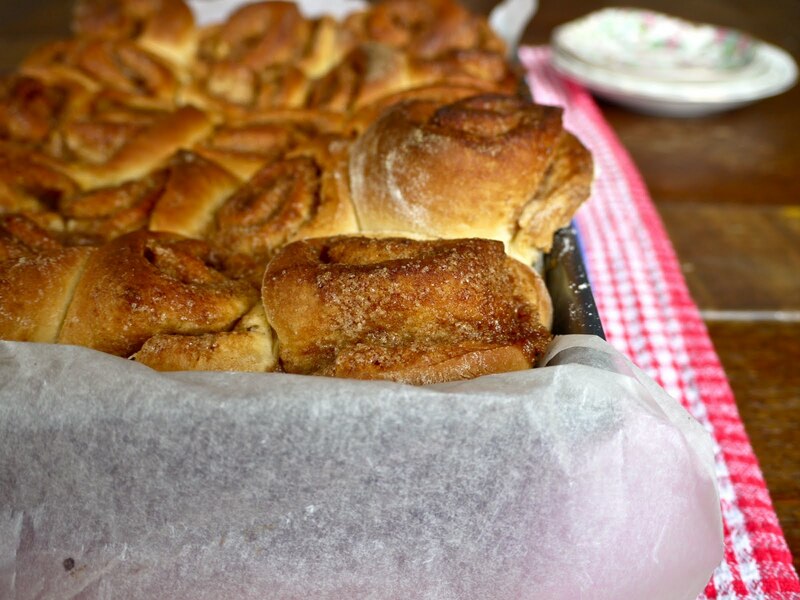 Bless all great cookbooks and cinnamon buns…… Hah! Oh and how was the Mozart opera thingy? Vanille: Thanks 🙂 they stayed fluffy, too! Sue: haha thanks, and you're making bacon so you totally deserve it! Millie Mirepoix: I know, it's like…why aren't you fainting at my excellence? I nearly am! Haha. Heartbreak Pie: It's one of my most used cookbooks…such a treasure. Mum: WE never got to make anything as cool as cinnamon pinwheels in my stupid cooking class! Lani: totally. But the hood bakery will always have its place, till I learn the secret of their sweeeeet bread dough that is.